I’m here today to go against that which your mother, pastor, and crossing guard advised. These wise people kept you safe with the adage: never talk to strangers. If, like me, you’re old enough to remember life before the Internet, never talk to strangers wasn’t just an admonishment from grade school. With the spread of the world wide web stranger danger became one of the rallying calls of the nineties. Savvy Internet users had learned to be as suspicious as a Medieval peasant hearing a knock at the door in the middle of the night. An entire culture had to learn that an Internet avatar isn’t necessarily who they say they are. For many authors, this was for too long an unspoken hurdle. They were hoping to use social media to sell their books, but their social network consists entirely of their friends and family. These are not the people social marketing seeks to target! Why? Because Uncle Hagrid and Aunt Jimmy are going to buy your book no matter what; they are not the object of your marketing campaign. Moreover, these people are also your first readers, those you should be giving your book to, for free, in exchange for a fair review. In social marketing, the audience you’re selling to is not your personal social group. No. 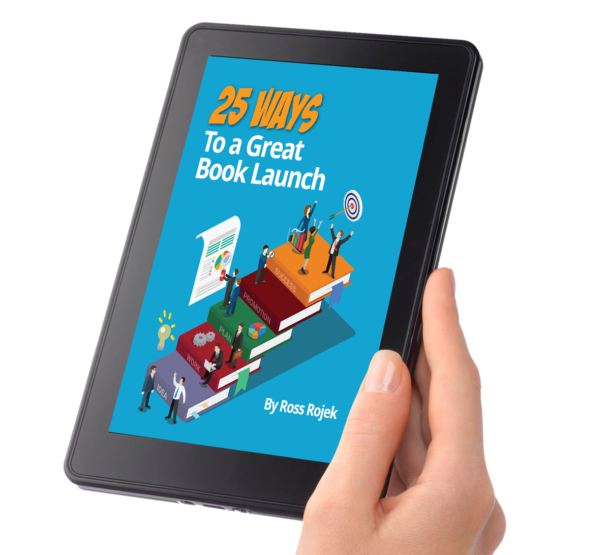 You are building a network of like-minded community members who are eager to tell strangers about you and your book. To make connections with reviewers, fans, and other stakeholders, you are going to be talking to strangers, not a little, but a lot. This is a huge unspoken hurdle for those who struggle with social media marketing. Young people go on the Internet for hours, nightly, searching Tumblr and Instagram for content they love, commenting and debating with strangers. In some ways this describes the sudden rise of Pinterest: it’s not just a social network favored by women. For many of those women, it was their first exposure to that experience that millennials indulge in nightly. Women who previously only interacted socially with friends and family on Facebook would get lost exploring Pinterest for hours, with nary a thought of stranger danger. As you begin your book marketing journey, I encourage you: talk to strangers. Take stock of your social strategy. Are you reaching out beyond your personal network? In the coming months, I’ll be showing you how you can build your network. Gather your favorite candy and get ready to make new friends. I instruct my clients to think of social like it is a networking party. Though many writers are intimidated by social media, they’ve understood and participated in networking groups for decades. Almost every business writer has attended a networking meeting at some point, and most fiction writers see the value of attending a conference like the San Francisco Writers Conference. Who’s getting this business card? I give you a hint: it’s someone in the room. Raul is a good writer who never misses this event. He’s friendly and approachable, though his t-shirt has a spelling error and a Dorito’s stain. Bob is an exceptional writer. He was unable to attend the meeting, but he was able to set up a small table with brochures about his latest book. The question: Who is Jane most likely to call the next day for more information? The answer, I hope, is easy: Jane may or may not set up a meeting with Raul, but he has a chance. He can explain the shirt, crack a joke, be a person. 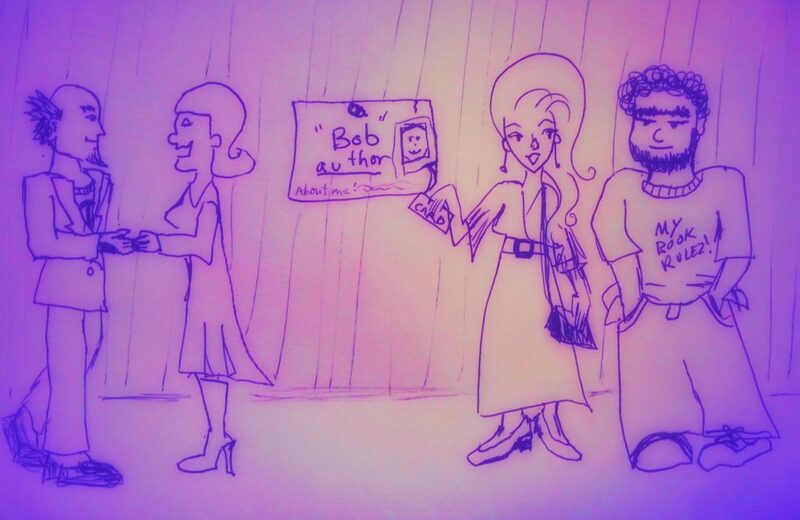 But the likelihood she’ll follow up with Bob is slim. Maybe she’ll take a brochure home, but will she look at it? It’s those human interactions that motivate us. Compare this to having a social profile for a social media community that you seldom login to. It’s not bad or wrong to set up a Twitter profile if you’re never logging into Twitter, any more than it is bad for Bob to leave his brochures. But it isn’t any way to build a following. It’s through interactions that you build your platform. They can be brief, but they must be real. And for that, you have to be logging into the site and interacting with people. The same goes for automated posts. Social media pros spurn plugins and apps that automatically send your latest post to Facebook, but those same pros are often working from an unlimited budget with staff that can devote hours a day to posting. Realistically, most authors have limited time and resources. A tool to send your post to a social network is a great way to save time, but it’s not a social media strategy. You need to be on the site, participating, like Raul—Dorito crumbs and all. A common misconception is that social media is about gaining likes and followers. This is wrong. This approach likens social media to a billboard and leads to treating social like simply another form of advertising. Likes and followers are a way to measure your success, but they are not the goal itself. Your goal is to network and build community. Even writing a book isn’t truly in isolation. To write in a genre, one must be familiar with the conventions of that genre. To write a great mystery book requires the author to have read plenty of mystery books herself, and the purchase and collection of these books is a quiet way to get into the mystery readers community. Publishing a book requires even more. Finding a publisher, meeting your agent, getting reviews, and building your fan base all require active involvement in a community of literary folks. Decades ago, this was achieved by snail mail or by attending conferences and other events. But now, with social media, we can participate in that community in the comfort of our homes, dribbling our Doritos, and kicking our bunny slippers onto our coffee tables. Your objective with social media is to establish and foster relationships in your literary community and to make yourself a known and reliable member of that community. Yes, likes and followers are a measure of that—if you’re doing it right, they’ll come naturally. Twitter is the never-ending networking party where Neil Gaiman, Margaret Atwood, Stephen King, and JK Rowling might show up at any minute. Treating your social media presence like a networking gathering resolves several issues people often have. The first is the complaint that social media isn’t worth the time when you’re getting started because you have few followers. This approach treats social like advertising and it’s true that if you have few followers there are better ways to advertise (in this regard, one never seems to have enough followers!). But if you go to a networking party where you don’t know a soul, so much the better. It will force you to really meet people, interact. Remember that a single connection with the right person—say an agent or editor—can be extremely influential. Social media gives you that power, no matter how many followers you have. It also helps to answer common social media marketing questions, such as: “What should I share?” “How often should I post?” “Who should I follow?” I’ll delve more into those questions in future posts, but for today, think of the first thing you do at a networking meeting or other meetup. Perhaps you sign in and get a name tag (which one might liken to getting an account and profile), but once you’re in the room, you take stock: look around at the brochures, quietly join a lecture or conversation. Thus, this approach to social media teaches you to listen. What you give back to a community depends on what it needs. So our strategy will come from listening. Listening is the first step in the critical thing that makes social media unique: participation. The more active you are on a site, the more you come to understand its particular culture and interact with its users, the more success you will find. Karma Bennett has been working in publishing for over a decade. She is the founder of Future Is Fiction Communications, a marketing company that specializes in digital marketing for authors. Recently she launched WordPressBlogsForWriters.com to help authors set up professional and easy-to-use websites. She has spoken on digital marketing topics for the San Francisco Writers Conference, Writerly’s Pub Camp in Seattle, and Sisters in Crime. She teaches classes on SEO, social media marketing and WordPress at AcademyX and Bay Area Video Coalition. You can find her singing at the grocery store, dancing in the streets, and writing bios in the third person. I love this! “Thus, this approach to social media teaches you to listen. What you give back to a community depends on what it needs. So our strategy will come from listening. Listening is the first step in the critical thing that makes social media unique: participation.” Thank you.